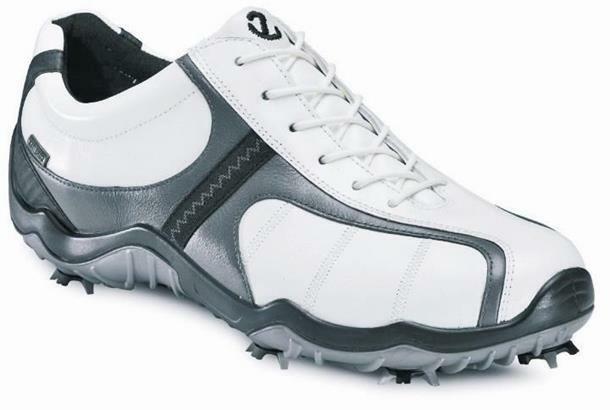 Taking its cues from modern men’s fashion, the Ecco Men's Golf Street Golf Shoe is from a truly versatile collection as much at home on the course as après golf. Luxurious, full-grain leather uppers sit above a new, low-profile, direct-injected PU midsole. A vulcanised street shoe look is enhanced by a thin, coloured strip detail on the midsole and metal rivet accents. The sleek, semi-transparent TPU outsole showcases stylish colours, as well as pre-moulded traction bars that are extremely durable and provide enhanced grip. Synthetic blend wide-flat laces are provided in two different colors for added use customisation, including a contrast colour option that really stands out. Available in concrete/white/cactus and licorice/coffee/Fanta colour options.